Gold plated shamrock earrings are studs with green enamel leaves. These shamrock stud earrings feature an 18K gold plated finish along with green enamel accented leaves. The shamrock earrings are on posts with push on butterfly backs and they measure 3/8” wide x 3/8" tall. Shamrock pendant is a gold plated design that features green enamel leaves. Dangle shamrock earrings feature a gold plated finish along with green enamel accented leaves. 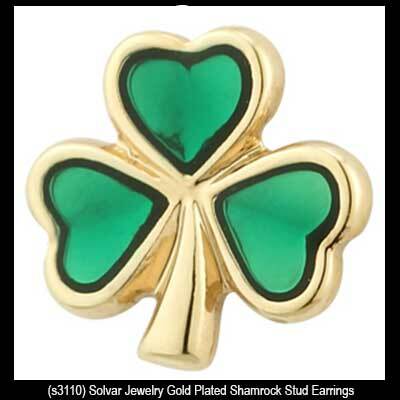 Gold plated shamrock earrings are studs that feature green enamel accented leaves.